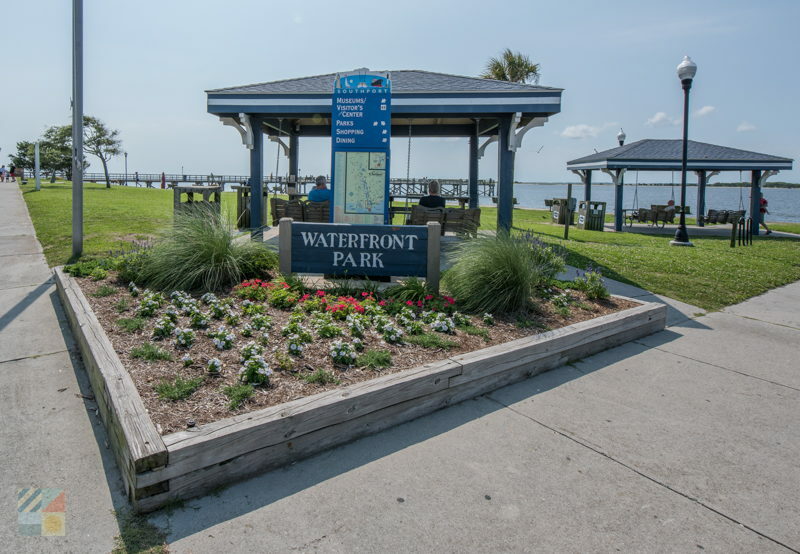 The 9 acre park has a stunning location that borders both the downtown streets and the Cape Fear River waterfront, and while the busy central streets are a Mecca for dining patrons and antique lovers, it's hard to turn away from the park's stunning open water views. 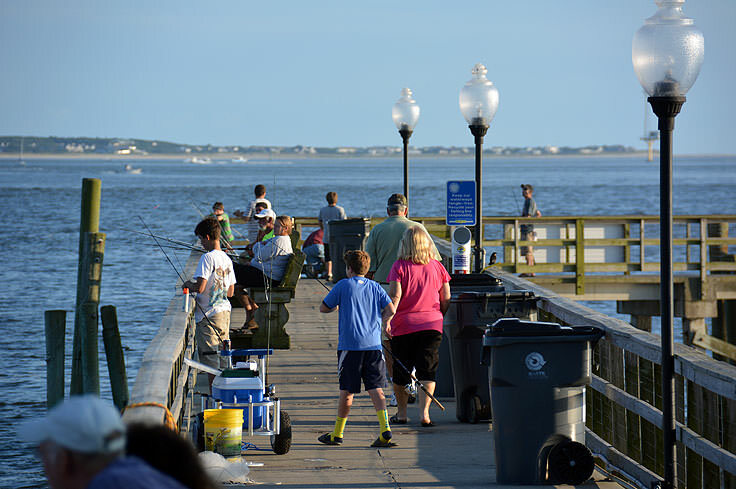 The locale is a high traffic area for commercial fishing vessels and Intracoastal Waterway travelers alike, and a visitor could spend hours on the shoreline, watching the ships churn in and out of the mouth of the Cape Fear River. 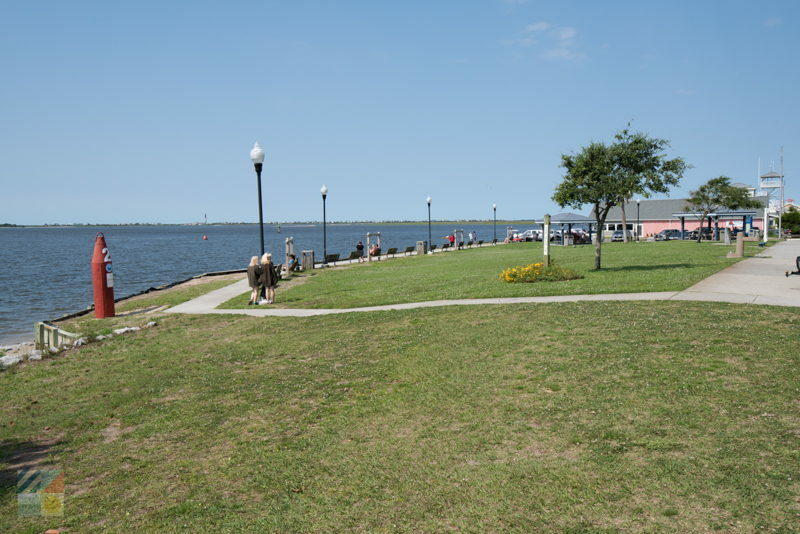 Because the vista is so captivating, the park features a long line of comfortable wooden benches, adjacent to the water, so that everyone can find a quiet place to lean back and enjoy a long look. There are also picnic tables and shelters close to the park's entrance for a shaded lunch, water fountains, swings, and a lighted walkway for evening strolls. 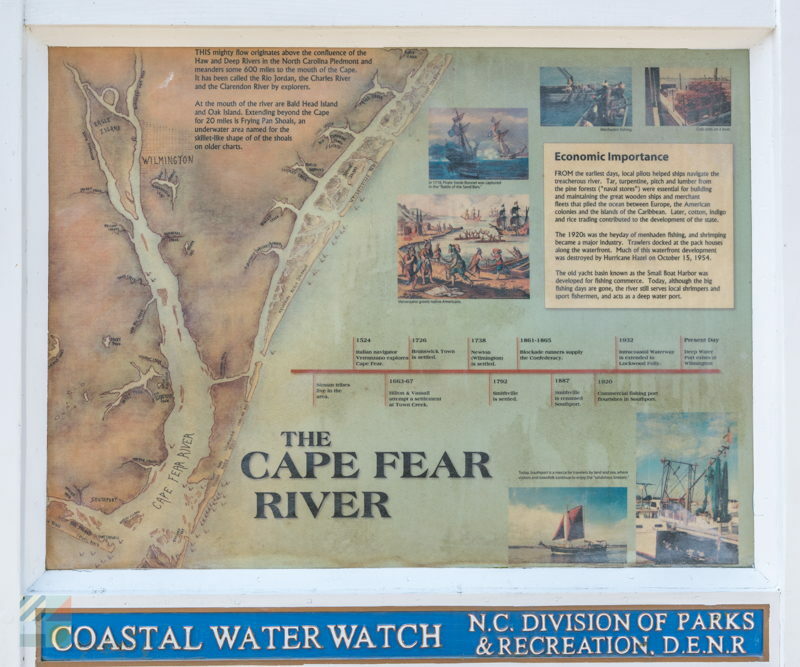 The park is also popular for its proximity to the town fishing pier, a long "L" shaped wooden pier that extends into the Cape Fear River. 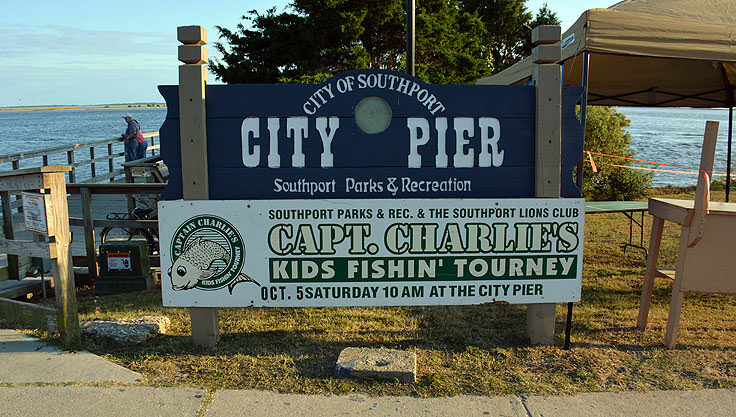 Handicapped accessible with public restrooms located nearby at the Garrison House, the pier is free to the public, ensuring that anyone can grab a rod and reel and see what's biting in the deep, and mainly salty waters. 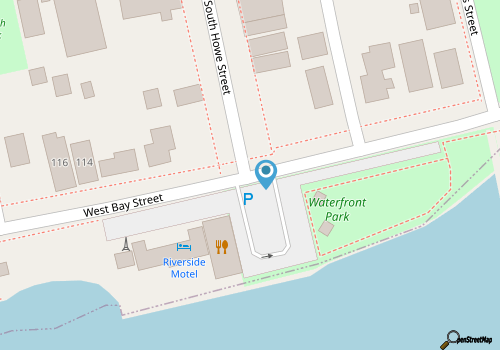 The park is open year round, and is easy to find along waterfront Bay Street. 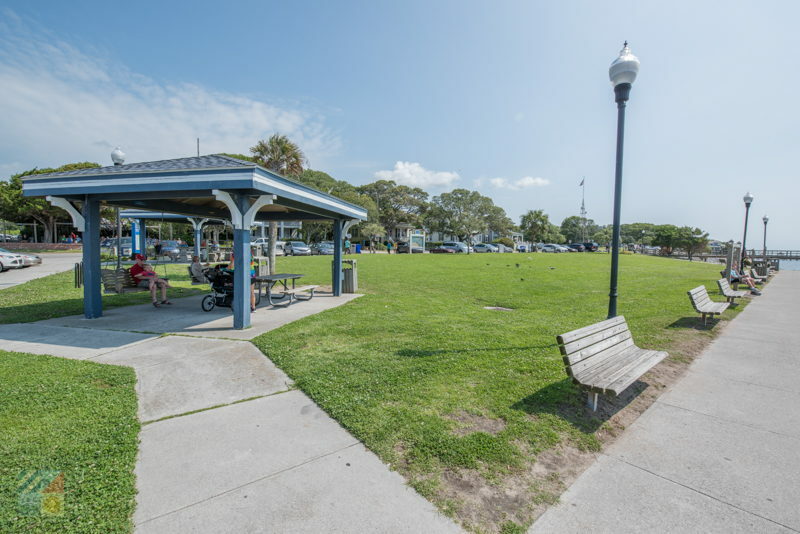 There is ample parking available, although the park and the pier can both be popular destinations on summer and holiday weekends. Visitors who intend to sit and stay a while are advised to bring along sunscreen, as the sun can be particularly harsh so close to the waterfront. A camera is all but required, and park patrons will also want to look for the distant views of the Bald Head Island lighthouse to the south, and the neighboring shores of Fort Fisher and Pleasure Island that can be spotted in the distance across the wide Cape Fear River. The Southport Waterfront Park is arguably one of the best places in Downtown to catch an incredible view, and waste away an afternoon or evening just admiring the waterfront scene. An ideal spot for picnics, fishing, strolling, or just enjoying the act of doing nothing, this small park is a favorite hang-out for both locals and visitors who need to take a breather, relax, and simply watch the world go by.